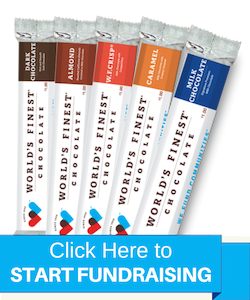 There are many moving pieces that go into making a fundraiser successful. From budgeting and planning to actually running your fundraiser, each decision can make or break your profits. Raising awareness is perhaps one of the most important parts of your fundraising campaign. These five tips will help you promote your fundraiser in the most effective way! Have some other successful school fundraising ideas of your own? Let us hear from you! Facebook is the perfect place to start building the foundation of your social media presence for your fundraiser. You can create a Facebook Page or Event which will allow you to post sales updates, share sales tips, and send reminders. The goal is to keep your audience engaged in your cause. A visual representation of how close you are to reaching your goal can keep everyone motivated and focused. To amplify your message, try posting on other social media platforms such as Twitter and Instagram as well. Not only is email a cost-effective option, but it is also a preferred method of communication for most age groups. Perhaps the easiest to execute, emails are proven to deliver results if done correctly. The key is to provide new and exciting content in each email you send out. Contact your email list early and often, being sure to share success stories and progress updates every step of the way. Send out a personalized thank-you email to anyone who contributed (big or small) to the success of your campaign. Not only does this show genuine appreciation, it also improves your chances of renewed support for your next fundraiser. Reach out to people and businesses in your community to find ways to collaborate. Use the community’s events to promote your own campaign by setting up an informational booth, launching a pop-up shop, or just networking with potential supporters. You can even post about the businesses that help you out on your organization's Facebook page, providing free promotion for their good deeds. It’s a win-win situation. Whether you are posting on Facebook, sending out an email or hanging up posters, make sure you do so on a consistent basis. It's also important to keep all the marketing messages consistent. You can do this by using the same color scheme, pictures, hashtags, etc. on all messaging. This creates less work for you and helps your audience easily recognize your campaign. It’s easy to get caught up in the craziness of your fundraiser, but remember to have fun and stay positive throughout the campaign. This enthusiasm will branch out to other aspects of your fundraiser and will create an environment that everyone will want to be involved in. Everyone involved will feed off your fun, positive energy. Attitude is everything! Need Help Promoting On Social Media? Contact us at 1-888-821-8452 or by email. © World’s Finest® Chocolate. All Rights Reserved.